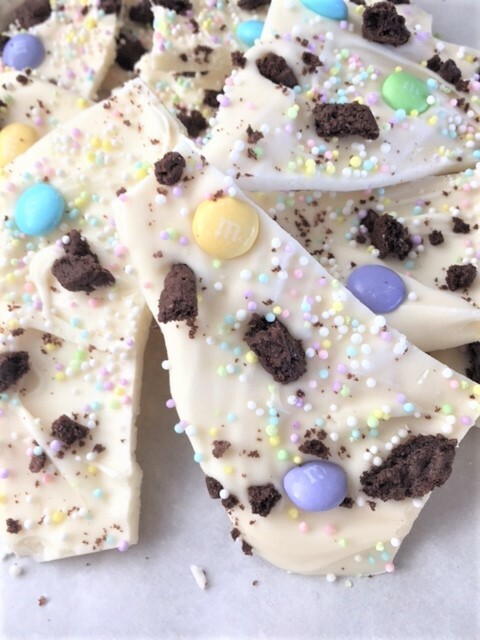 Easter Bark and Peep Treat……………. 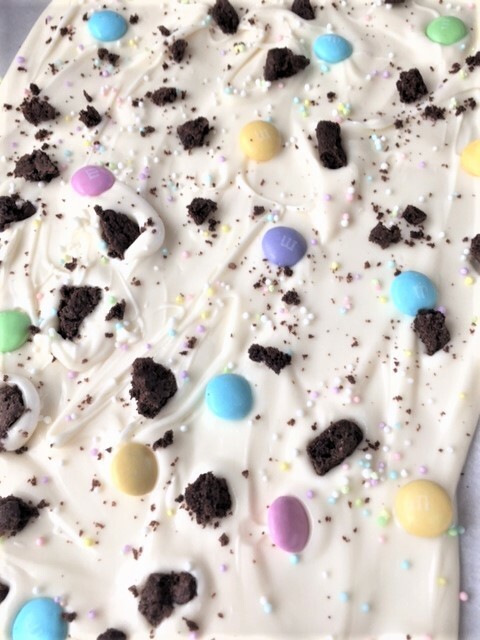 Another Easter treat to share with you. This is a super simple-add whatever you want kind of candy treat! 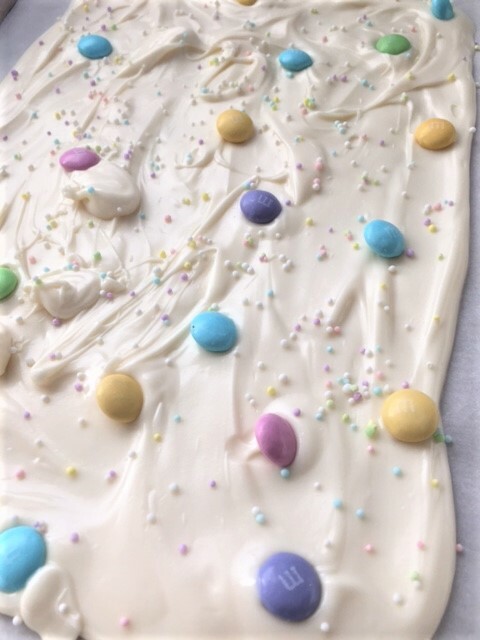 On this one, I used a bag of the Wilton candy melts. You can find these at Michael’s Craft stores, Joann’s Fabric stores, Hobby Lobby, etc. They are less than $3 a bag and come in a variety of flavors/colors. But you can always use a bag of chocolate chips, butterscotch chips, white chocolate chips, etc. That’s what I usually use. 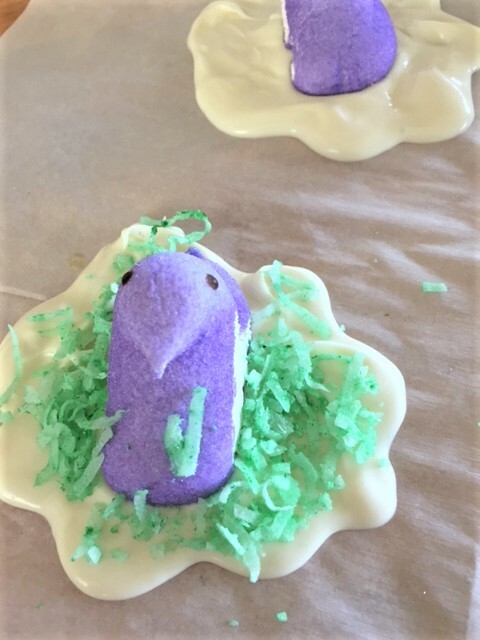 Then all you have to do is melt them in the microwave and top it with any of your favorite Easter candies. I added some chocolate cookie pieces too. Be creative! Let your kids and grandkids join in…..they will have a blast. On these, I poured a bit of the melted chocolate out, stuck a peep on it and then sprinkled some green coconut** on top of the melted chocolate. 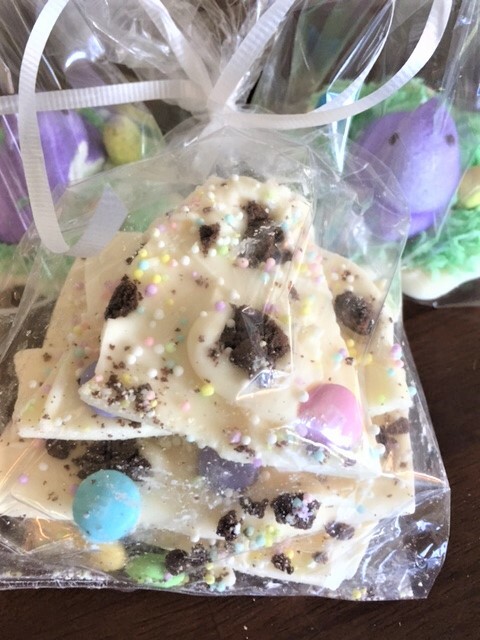 Then I put a few Easter egg candies onto the chocolate. Let it all set up. 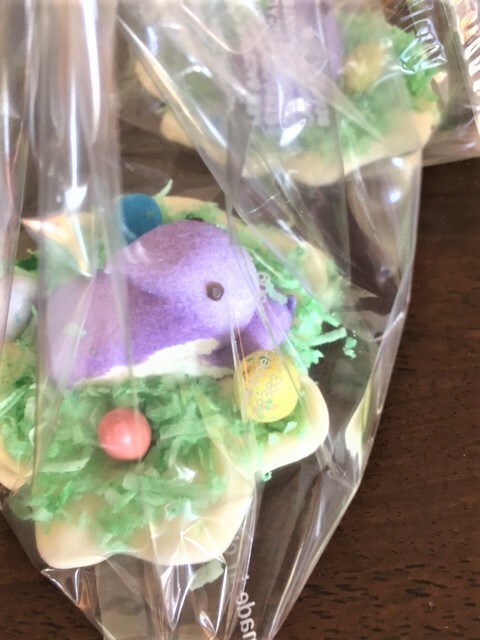 Place it in a cellophane bag and there you have a cute little treat to give to some bunny. Pour the melts or chips into a heat proof bowl. Microwave in 30 second increments, until melted. It really should only take about 45 seconds to melt. Give it a stir until smooth. Pour the mixture out onto a wax or parchment lined cookie sheet. Spread out to about an 1/8 – 1/4 of an inch. Sprinkle on the goodies of your choice and slightly press into the top of the melted mixture. Allow to set on your counter, or place the cookie sheet in the refrigerator, until set firm. Once it’s set, break or cut into big pieces. Place in cellophane bags and tie with ribbon. Or put the bark in a tightly sealed container. Just put a small amount of the melted chocolate onto parchment or wax paper. Spread it out a bit. 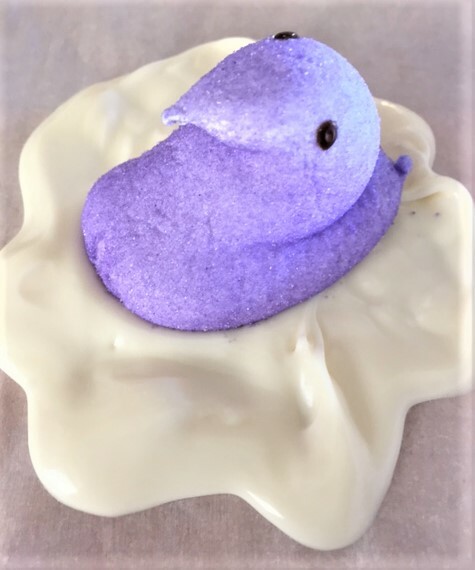 Place a peep or bunny onto the melted chocolate. 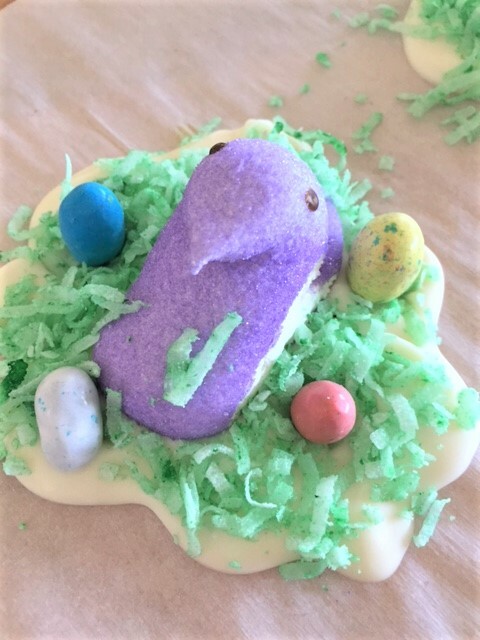 Sprinkle colored coconut on the melted chocolate, around the peep. Place some candy eggs around. Allow to set. Place in little gift bags. **To color the coconut, just drop a tiny bit of food dye on the coconut. Mix it all up with your fingers until the color is even. Allow to set for about 10 minutes.